Since its inception, Triple E Equipment has had one goal in mind: To make the lives of contractors easier. The company started out with the world’s first and only battery-powered compact tool carrier, the Sherpa 100ECO, but now has expanded its product line to include a remote-controlled compact tool carrier, the Sherpa 100EHD, as well as battery-powered concrete buggies and wheelbarrows. The Sherpa 100ECO is still its most popular product and is widely used throughout North America because it is still the only battery-powered compact tool carrier currently available on the market, says the company. With its mini tool carrier line, Triple E Equipment has been able to help demolition contractors save time on projects, keep concrete cutters from hurting backs while lifting heavy objects and so much more. The Sherpa 100ECO has been altered over time with small changes to make servicing the machine easier, but the overall size and mechanics of the machine have gone unchanged. The machine has always been 31 in. wide, weighed under 1,600 lbs and has a full dump height of over 6 ft, 3 in. 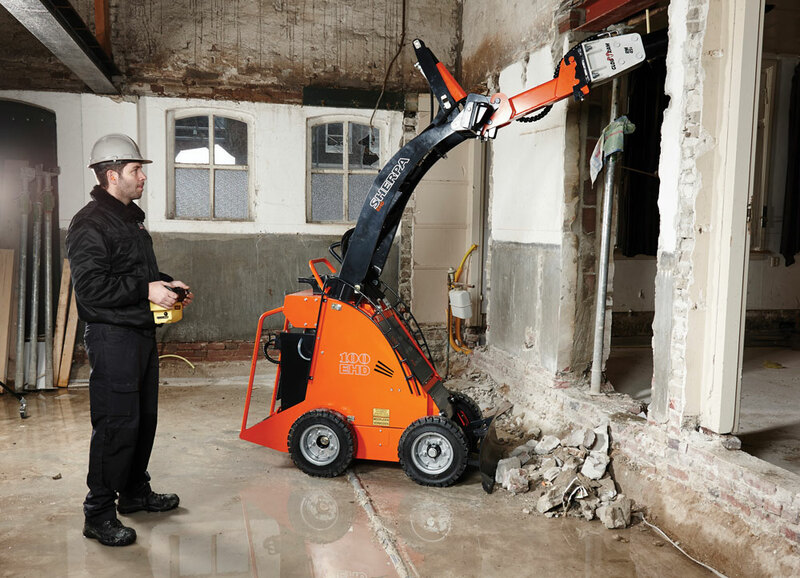 It is the perfect machine to clear debris in an occupied building that has a fume restriction or general landscaping without the noise of a combustion engine. Similar to the 100ECO, the Sherpa 100EHD has a width of 31 in. that makes it easy to remotely maneuver through single doors and into dangerous areas. The Sherpa 100EHD is also four-wheel drive with a wheelbase of 26 in. and has 5 in. of ground clearance. Both the Sherpa 100ECO and the Sherpa 100EHD have tipping loads of over 1,000 lbs, so they are the perfect solution for the heavy lifting on your next project. These two compact tool carriers are the first machines of their kind that can be operated as efficiently and safely indoors as they can outdoors, says Triple E Equipment. There are a metric ton of attachments for the Sherpa line of compact tool carriers due to their hydraulic auxiliary functions. Currently, the company offers more than 30 different attachments ranging from hydraulic clamps and pallet forks to concrete mixers and vacuum lifts. The most popular attachments are the grapple bucket and vacuum lifting system, but each customer is different and has the ability to get a custom solution to help make their projects easier. The Sherpa 100ECO has been used in many different applications. It has been used in the largest LEED Double Platinum Certified building in the United States and at The California Academy of Sciences for green roof maintenance and landscaping. This unit was once even used in Miami Children’s Hospital for a select demolition project while surgery was taking place on the other side of the wall. Triple E Equipment believes the electric motor makes this the most versatile compact tool carrier available in the marketplace today. The company likes to promote that these units allow for cost savings in labor, increases in productivity and fewer injuries on the job. They are versatile machines with no emissions that can fit through a standard door and are light enough for most elevators. Once you add a variety of attachments, the applications are endless for these innovative, electric-powered compact tool carriers. Learn more about Triple E Equipment here.